After six successive defeats Moneymore have got a victory at last and it was quite a resounding one. Eugene Young’s side had shown improvements in recent games and now, with a first win, they will be determined to pull away from the relegation area. They had the situation well in hand at the interval when a goal from ‘man of the match’ Patrick Feeney and a well struck 29th minute penalty by Rory Young put them in a comfortable 2-7 to 1-2 lead. Slaughtmanus had got their major from Adrain O’Kane. Slaughtmanus did improve on the resumption but they were very open at the back as Feeney scored 2-6 from plays. Further goals from Emmett Crozier and Feeney underlined a fine performance from the winners. Slaughtmanus with a much changed team kept battling away but even though Kevin King did register some good scores they never could get within touching distance of the winners. Moneymore scorers: Patrick Feeney 2-6, Emmett Crozier 1-1, Rory Young 1-0, Paudie O’Neill 0-3, Barry O’Neill 0-2, Callum Bloomer 0-1. Slaughtmanus scorers: Adrian O’Kane 1-1, Kevin King 0-4, Barry Lyons 0-2, Ciaran McGuinness and Mark Barr 0-1 each. Neither of these teams are likely to be in the winners enclosure but both served up a most enterprising and entertaining game at cold and windy Billy Doran Park. Drumsurn did not make full use of the wind in the first half and given the chances they were presented with their two point lead should have been at least doubled. They did manage to go four up at one stage in the second half but for the last 20 minutes it was ‘backs to the wall’ as Ballerin mounted attack after attack and really should have finished in front. The experienced Ciaran Mullan strode through a static Ballerin defence to get their first half goal and he was instrumental in setting up his cousin Anthony McLaughlin for their second half goal. Ballerin did have the chance of a major in the second half but Stephen Harbinson pushed a Paul Ferris shot against a post and out of danger. Ballerin’s eight second half wides proved costly in the end. Drumsurn did suffer a major set back when their best defender Daryl Mullan got a black card for a hand trip on a Ballerin player. Both teams adopted an all out attacking game from start to finish and inevitably it was Ciaran Mullan who got Drumsurn’s only score in the last fifteen minutes when he converted his own free. Just prior to that Eugene Mullan who had a terrific game for the visitors got his tenth point of the game to give his team the lead for the first time. Poor finishing combined with good Drumsurn defending saw Richard Ferris’s team cling on for a hard earned point which at this stage of the season leaves them in a comfortable position. Drumsurn made a very good start with the wind in their sails and after eight minutes were 1-2 to nil in the lead. On either side of Ciaran Mullan’s point Pearse McNicholl and Ryan Mullan had sent over points. Defender Mark Ferris opened for Ballerin in the 10th minute following a long solo run and Eugene Mullan quickly followed with a successful free. Pearse McNicholl converted after Harry Foster was impeded but Ballerin were dangerous on the counter attack and Pascal McKay hit over a wonderful point. The other Ciaran Mullan operating at corner forward opened up a four point gap mid way through the half. Then big midfielder Cahir Mullan cut through for a well taken point. A trio of Eugene Mullan points inside four minutes left just two points between them. Keeper Stephen Harbinson should have done better when he tipped another Eugene Mullan effort over the bar to leave the score 1-05 to 0-07. Drumsurn midfielder Ryan Mullan landed a brace of quick point from open play but Liam Brown for the opposition nicked a point to leave the St. Matthew’s with a slender two point lead with the wind to face in the second half. Ciaran Mullan hit two quick points on the resumption one of them from a free to put his team four points in front. Mark Ferris pulled one back in the 35th minute but Pearse McNicholl quickly responded to keep the four point margin between the sides. Then came the Daryl Mullan black card but this did not stop McNicholl from stretching the margin to five points on the score of 1-10 to 0-8. From there on the faster and fitter looking Ballerin dominated the play. Eugene Mullan, Mark Ferris and Pascal McKay quickly brought the margin down to two points. Then hen a goal looked inevitable the home keeper Stephen Harbinson saved a point blank shot from Paul Ferris. The experience of Ciaran Mullan at full forward was evident when he played in Anthony McLaughlin in a break away and the sturdy wing back slipped the ball to the net and Ballerin had to start their fight back all over again. Now leading by 2-10 to 0-13 the home team were forced back as Jarlath Bradley narrowed the gap. Paul Ferris then sent a free against a post but Eugene Mullan had better luck when he tied the game up. Three wides in quick succession from Leigh Ferris, Eugene Mullan and Mark Ferris looked as if the would prove costly for the visitors until Eugene Mullan gave his team a 0-17 to 2-10 lead. Ciaran Mullan’s late free gave a relieved Drumsurn a share of the spoils but all credit to both teams for producing a very open and entertaining game. Drumsurn scorers: Ciaran ‘Banty’ Mullan 1-3, 0-2frees, Anthony McLaughlin 1-0, Pearse McNicholl 0-3, 0-1 free, Ryan Mullan 0-3, Cahir Mullan and Ciaran Mullan 0-1 each. Ballerin scorers Eugene Mullan 0-10, 0-4frees, Mark Ferris, Pascal McKay and Liam brown 0-2 each and Jarlath Bradley 0-1. 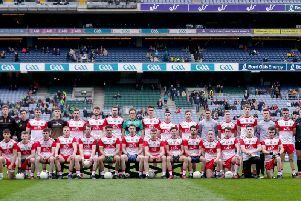 Drumsurn: Stephen Harbinson, Dane Mullan Odhran Rafferty Sean Butcher, Christopher Harbinson, Daryl Mullan, Anthony McLaughlin, Ryan Mullan, Cahir Mullan, Harry Foster, Pearse McNicholl, Aaron Butcher, Ciaran Mullan, Ciaran B Mullan, Francis Chivers. Ballerin: Ronan Mullan, Shea Doherty, Stephen Mullan, Shane Ferris, Callum Bradley, Mark Ferris, Jarlath Bradley, Willie McGilligan, Pascal McKay, Eugene Mullan, Damien Cassidy, Liam Brown, Paul Ferris, Shaun Mullan, Bobby Mullan. A badly depleted Craigbane made the long trip to Ballymaguigan who were also under strength and won a tight game by a point. It was Craigbane’s ability to get goals that kept them in the hunt. They had scored four the week before in losing to Drumsurn and three in this game which also ended in one point defeat. In breezy conditions the home team deserved their win and from an opening day hammering by Castledawson player manager Darren Conway has them moving in the right direction. Craigbane badly hit by injuries were without three further players including top scorer Lee Moore under suspension. Ballymaguigan picked off some nice scores and were good value for their one point victory. As was expected this was a turkey shoot for the strong and well organised Castledawson against a very young Limavady team that competed well in the early stages of the first half but soon fell away. Goals by Aidan Keenan and Ryan Connery set the Broagh men on their way to a match winning 2-11 to 0-04 lead. Limavady just mange to score another two points in the second half while the home team picked off points at will. Limavady now occupy the bottom spot in the division and their game at home to Moneymore next week will be vital. Doire Trasna came within an ace of pulling off a shock victory at home to unbeaten leaders Greenlough after a superb team performance. The Waterside men led for most of the game with some excellent defending all over the pitch but were undone by injury-time points from Greenlough duo Cormac O’Neill and Fintan Kelly. The new Trasna managerial duo of Eoghan Carlin and Enda Lindsay have their team well organised and they have become the first team this year to get close to the Greenlough team. The Waterside men led through centre-half back Gavin Kelly’s long range opening point and with a number of young players like Ciaran McGowan, Connolly Deeney, who nullified Brian McCallion, Cathal McKane, Daryl Mallett and Tomas and Micky Kelly really stepping up to the mark, the teams were level on 0-5 each at half-time. For much of the second half the home team managed to stay in front but the persistent league leaders kept plugging away to grind out a valuable win with those to very late points. Doire Trasna scorers: Damien Starret 0-5, Darren Harkin 0-1, Colin Murray 0-1, Michael McNaught 0-1, Gavin Kelly 0-1 each. Greenlough scorers: Ryan Tohill 0-4f, Cormac O’Neill 0-2, Robert Kelly, Fintan Kelly and Conal McErlean 0-1 each. Desertmartin were in no way flattered by their three point winning margin. Despite trailing by 2-1 to 0-4 at half time the signs were there that Desertmartin meant business. The game was held up for a lengthy period in the second half when a Desertmartin player Adie McGuigan got a severe facial injury in a collision. That early Patrick Coey goal looked to be setting up Lissan for a big start but they never really got going even with another major this time from Patrick McElroy. Desertmartin had much the better of the second half scoring 1-9 to just 0-4 from the hosts. Desertmartin have had their fair share of injuries this year and with a suspected jaw fracture Adie McGuigan will miss much of the remainder of the season. Overall it was a disappointing display by Lissan who had won well the week before. Lissan scorers: Patrick Coey 1-1, Patrick McElroy 1-1, Ronan Laverty 0-2 and James Canavan 0-1. Desertmartin scorers: Declan Murray 1-5, Enda McGuckin and Paddy McCann 0-3 each, Dermot McGuigan and Gavin McGreevy 0-1 each.